Satellite lifts compatibility restrictions for a new crop of Mac-based producers. UAD-2 goes portable. Program at home, mix in the studio, master somewhere else. Even slower, older Macs can run oodles of UAD plugs. Can't run bus powered. Currently no PC support. At little over the size of a DVD case, the Satellite is easy to transport. The extra Firewire port round the back suggests the capability to chain Satellites may come in the future. We've covered UAD's plug-in releases for the last couple of years and, particularly with the release of the UAD-2 card, have watched the company grow and grow. With more and more esteemed names added to the roster of manufacturers who have teamed up with UA's software boffins, it's now possible to replicate the sound of Neve or SSL console mixes, add Moog filtering to instrument paths or even replicate the sound of Studer tape. "Now you can sling your entire software studio in a bag and take it from computer to computer." The list keeps growing and, with the imminent release of software Version 5.9, Lexicon's 224 reverb and new collaborations with Brainworx and SPL are soon to be added. This is and has been good news for existing UAD card holders but, as many reading this will testify, there are tons of us who now work on laptops, iMacs and Mac Minis, for whom full UAD compatibility has been impossible. 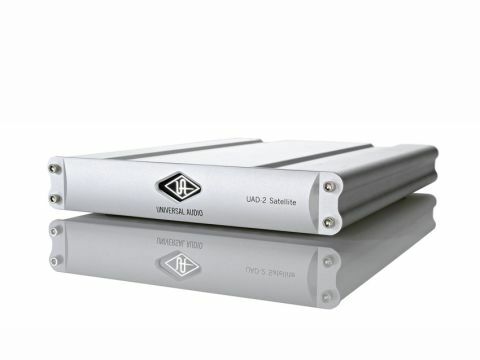 If you find yourself in this frustrated group, the subject of this review should be music to your ears, as the UAD-2 Satellite is an external FireWire 400/800 device, which gives any of those Macs, and more, access UA's software plug-ins. It's worth indulging in a little history here, as those with older or less fully spec'd Macs will no doubt be wondering whether they'll be able to run these high-quality plugs. The UAD system contains its own processing power and, in the case of Satellite, is available with either two (Duo) or four (Quad) SHARC processors that handle all of the processing required to run the plug-ins. As this is the case, even systems which struggle to run more than a handful of native plug-ins from your computer's CPU, will be able to access as many UAD-2 plugs as machines with processing power to burn. It goes without saying that there's no quality loss either - card or external box the way the data flows might be different but the sound is identical. There are some restrictions over which computers are compatible with Satellite however. You need to be running an Intel-based Mac (there's currently no support for PC) and you need to have Snow Leopard 10.6.4 as the minimum software requirement. UAD released a new operating system to coincide with the release of Satellite in the form of Version 5.8.1 so this needs to be downloaded but thereafter you're away with the plug-ins themselves capable of operating within AU, VST or RTAS hosts. We tried the Satellite with an old Firewire 400 MacBook (not even a Pro) and it slotted into our projects without a glitch (and with an audio interface sitting on the same port too). Likewise it worked great with our three year-old MacBook Pro, which is getting a little long in the tooth and frequently struggles (and overheats!) when running heavy native plug-in sessions. Do be warned that the installer triggers Logic to re-scan all of your AU plug-in validations (not just the UAD ones) so this will hold you up for a few minutes first time around. Thereafter, it was thrilling to see our ageing laptops integrate the current crop of UAD plug-ins into a new session and we could genuinely never have imagined being able to run a complex Neve or SSL emulated mix on such old machines. The Satellite hardware comprises a sleek silver box that is the same length as a DVD case and about a centimetre wider. The unit isn't bus-powered, which is a shame as it takes away from its portable nature, however it's understandable when you consider the CPU power required. It'd be nice though, to have a reduced-processing mode in order to achieve bus-power. The inclusion of a second FireWire port on the back suggests UAD might at some stage launch the capacity to chain Satellites to allow even greater power though this isn't currently available. It's worth mentioning that the second port will not emit any power so if you have a device that relies solely on bus power, it will need to be before the Satellite in the chain. As with the PCI cards, the rear of the unit also contains a toggling red/green LED which alerts you to any interfacing problems in 'red mode' or reassures you that all connections are made correctly when it's lit green. Aside from its functionality, Satellite provides portability and the opportunity for your UAD plug-ins to go wherever you do. All authorisations are stored in the Satellite itself rather than the computer it's attached to. This means that you can sling your entire software studio in a bag and take it from computer to computer confident that there'll be no authorisation sign-ins, transfers, headaches and foul-ups when you get to your destination. All you need to do is carry the UAD system software CD with you (or download it) and install it on your chosen system. Plug in via Firewire, start a DAW and - bingo - there are all your plugs ready to go. If you work exclusively on a Mac Pro in your studio, the PCI UAD systems remain viable an option but if you're programming from home but mixing and mastering elsewhere, this system is for you. Your Satellite will be ready for work before you've wiped the jetlag out of your eyes. You'll always require mains power but it's hard to imagine a more portable solution. Satellite should appeal to anyone considering making the UAD suite part of their studio set-up, regardless of the hardware they're using. The iMac and MacBook series of computers have become powerful enough in their own right in recent years to be considered worthy primary computers. And UAD has been smart enough to realise that there's an awful lot of them! The main advantages of Satellite are two-fold - not only will you be given access to plug-ins of exceptional quality, but none of the plug-ins you use will test your CPU in anyway. It's a killer combo provided you can afford it. Accordingly, this system not only catches up with those rivals but sprints past them too and we fully expect the release of Satellite to result in some users who'd resigned themselves to having to shell out for a more powerful computer doing some careful financial sums and having a change of heart.